I’m lying alone (at 2.20am) with my head on the phone… Thinking of you till it hurts. No, really, my chest really hurts. It started at around 9.30am today when I sneezed and I gasped because a sharp pain hit my chest. Before I could figure out what went wrong, I continued sneezing a few more times and I felt the same sharp jab on the middle-right side of my chest after every ‘ahhh choo’. 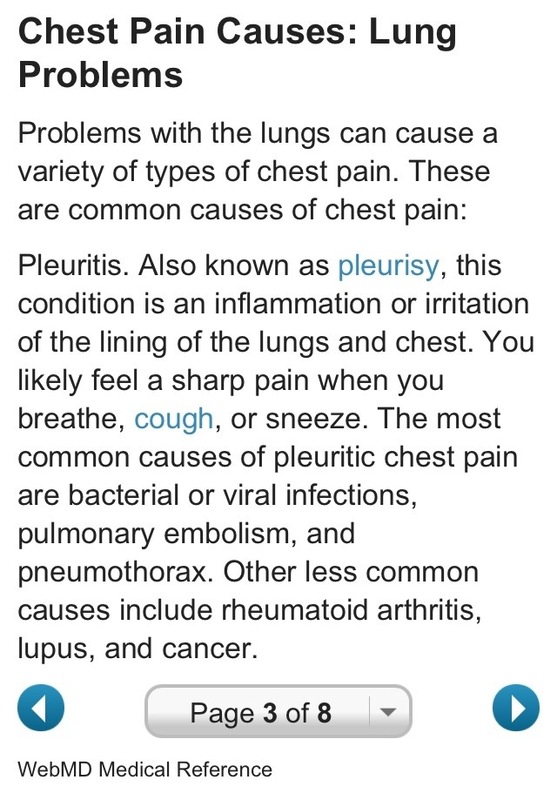 Every time I coughed or sneezed today was agony because my chest would flinched inwardly from the sudden flush of pain. So I tried breathing deeply and refrained from exerting too force or strength when doing anything. I still can’t sit or stand straight. I am thinking maybe I slouched too much and my posture the past four days was terrible, so it culminated to the chest pains today. You reckon so? Then I googled this WebMD site, which quite accurately described my symptoms (see pic above). Which also means my condition appears to be more serious than I thought. Omfg! It’s more than 17 hours since my chest had hurt and the pain is still here. I can’t stretch or turn my body as it’d hurt. My verdict? I think I watched too much House MD TV series recently and I’m scaring myself over nothing. Well, if the pain doesn’t go off by next Thursday, then I’d go visit a doctor for some professional advice. Till then, wish me luck that I remain healthy to celebrate me turning 30.